Given how much I enjoyed Kinship, I think it was pretty much a given that I'd eventually try Métier. 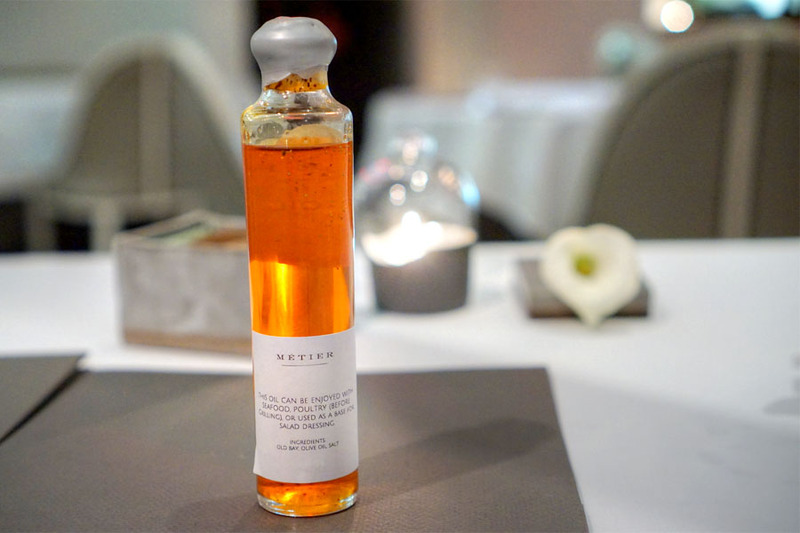 Named after the French word for trade or occupation, the restaurant opened in April 2016 and is again the work of Chef Eric Ziebold and partner Célia Lauren. 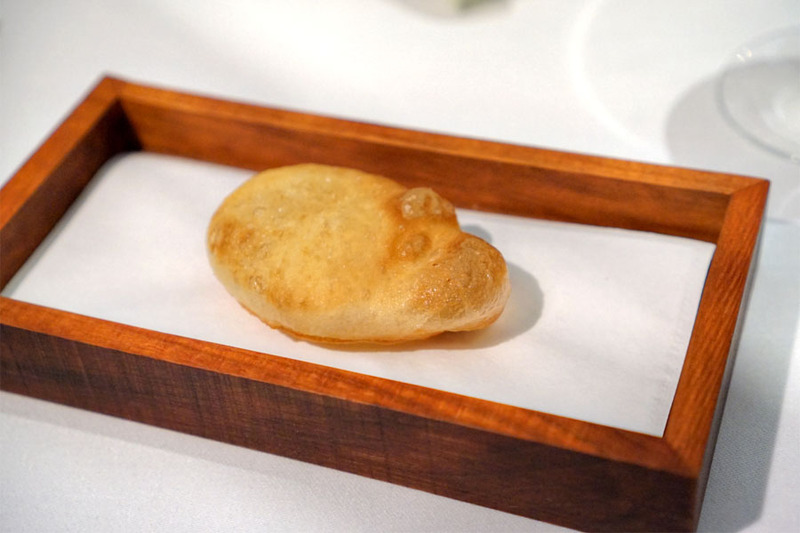 However, compared to Kinship, it's a tasting menu-only sort of place, one serving Ziebold's vision for elevated, contemporary American cuisine. 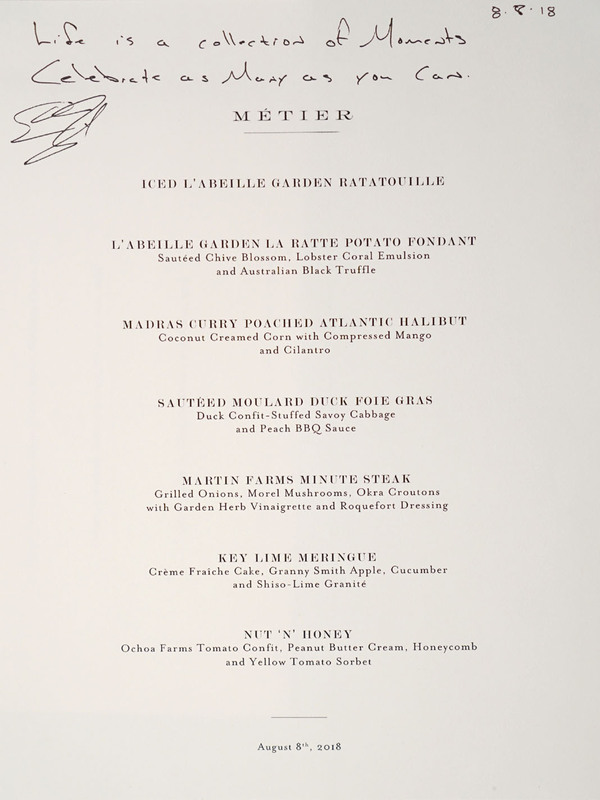 Métier was awarded a Michelin star in October 2017 (which it has retained), and perhaps more importantly, was deemed the best restaurant in the DC area by Washingtonian at the start of this year. 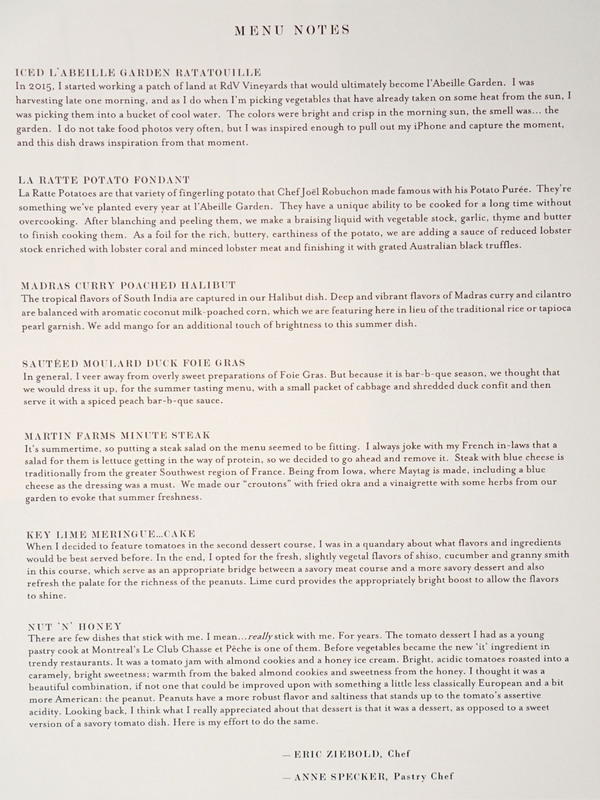 Métier is located underground, underneath Kinship, and is accessed via a private elevator. Upon stepping out of said elevator, you're invited to relax in the salon, where you can partake in an hors d'oeuvre and apéritif. 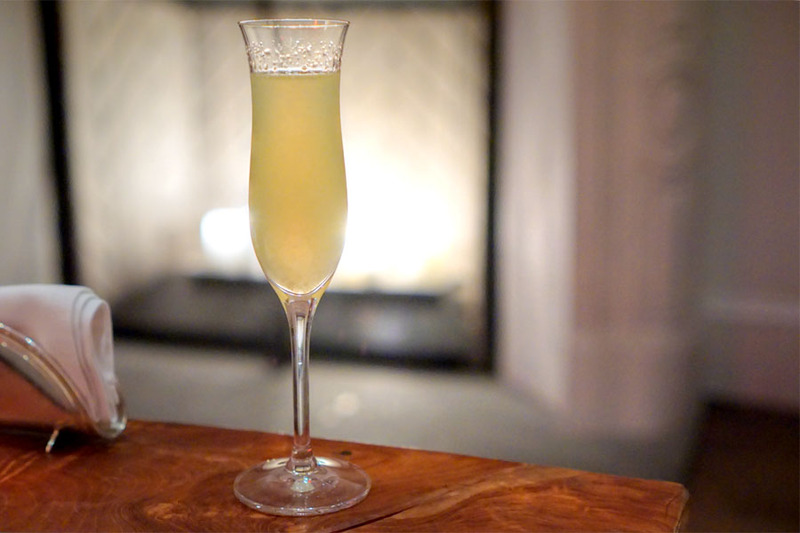 Tonight's welcome cocktail was an anise hyssop-melon spritz, a lively, invigorating concoction showcasing a deft balance between fruitiness and herbaceousness. To munch on, we received a dish of egg white bavarois with marinated caviar and Yukon Gold chips, which was pretty amazing. 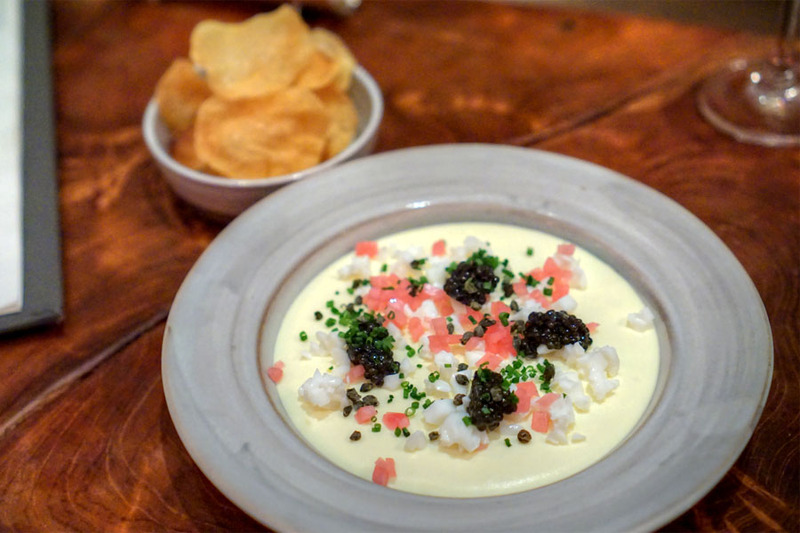 The custard melded the perfect creaminess of egg with a touch of sweetness, while the onion and caviar adding wonderfully contrasting hits of zestiness and salt. Think of this as the best sour cream and onion potato chips you've ever had. Given that we were in here for about 20 minutes, I went ahead and ordered a cocktail from the upstairs bar. 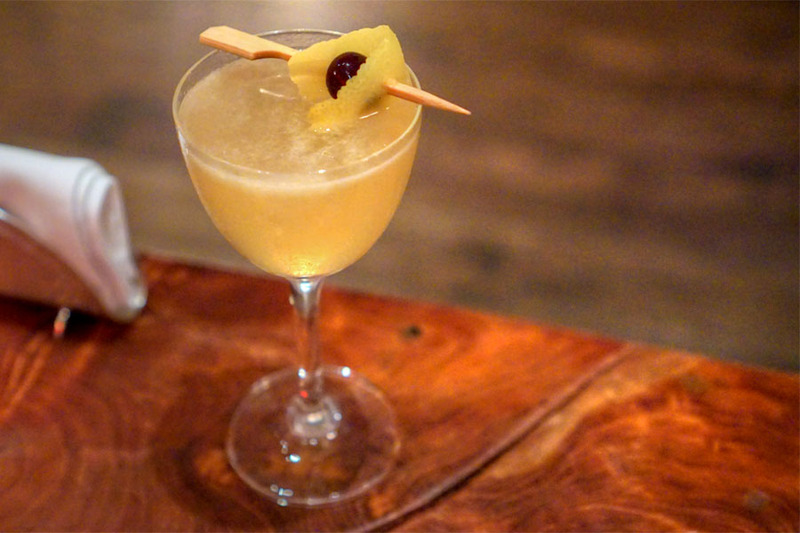 The drink smelled strongly smoky from the mezcal, with a distinct vegetal character and traces of citrus. Taste-wise, I got more smoke up front, leading to a marked savoriness and an interesting herbal-astringent element that I couldn't quite put my finger on--it was almost like a "hot" radish, if that makes sense. After some time, we were called into the main dining room. Penned by Darryl Carter (who also did Kinship), the space is a blend of the modern and the antique, and seats about three dozen. Note the 14-seater private dining room in the back. 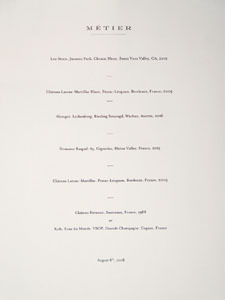 Above we see the evening's menu, comprising seven courses at $200 a head, inclusive of service but not tax or beverages. 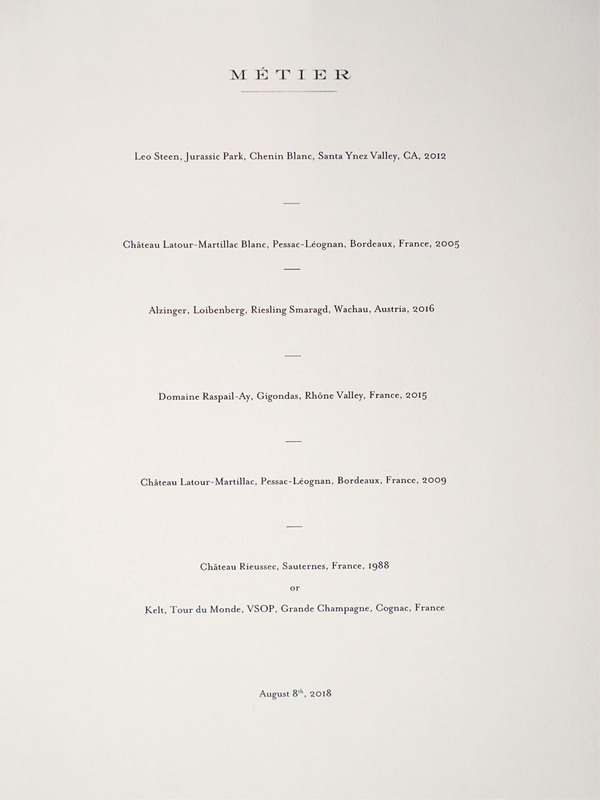 And speaking of libations, I opted for the wine pairing ($145), though of course there's a pretty extensive bottle list if you'd prefer, with prices ranging from "reasonable" to "used car." 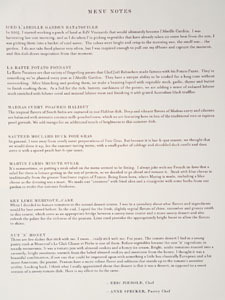 The menu notes were a nice touch I have to say. Click for larger versions. Given the hot weather we were having, it felt appropriate to begin with such a bright, refreshing course. 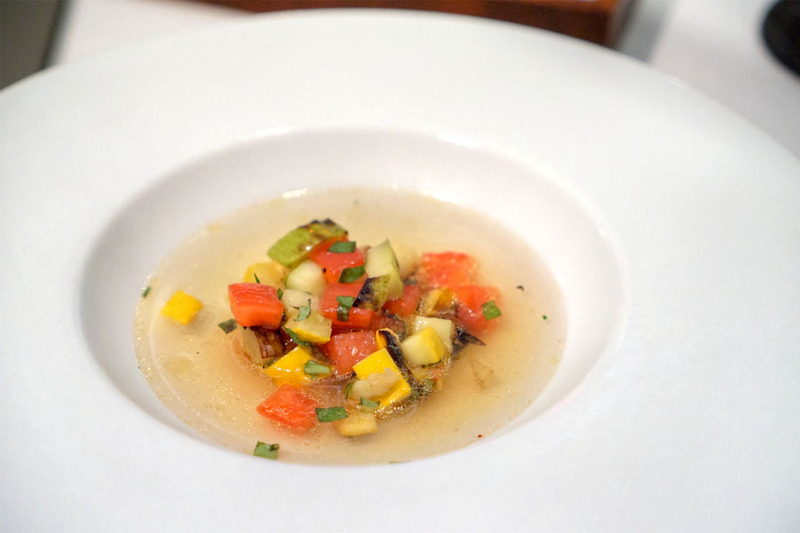 An unconventional ratatouille of sorts, the vibrancy of the veggies was on display--unmitigated, yet bound together by the potency of olive oil. The paired Chenin Blanc fit the bill nicely too, smelling fruity and earthy while the palate went in a sweet 'n' savory direction, with a steely minerality and agreeable acidity. The dish was accompanied by lángos, a type of Hungarian fried bread. Airy and light, it had a sweet-salty thing going and actually reminded me of Chinese you tiao. Next was as decadent of a preparation of potato as I'd ever seen. 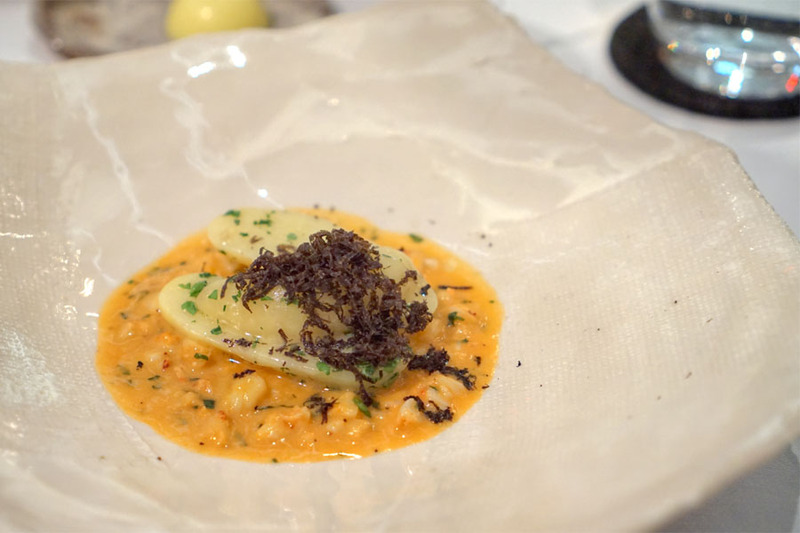 The Rattes themselves were pleasantly firm to the bite, and showed off a restrained richness that matched up beautifully with the luxuriousness and brine of that lobster sauce, all while the truffles imparted a further muskiness to it all. The dish stood up well to the paired wine. A Sémillon-Sauvignon Blanc blend, it displayed a sweet, oxidative nose and a palate rich and rife with nutty, buttery, oaky, vegetal nuances. Interestingly, it actually became much more fruit-forward when taken with the food. 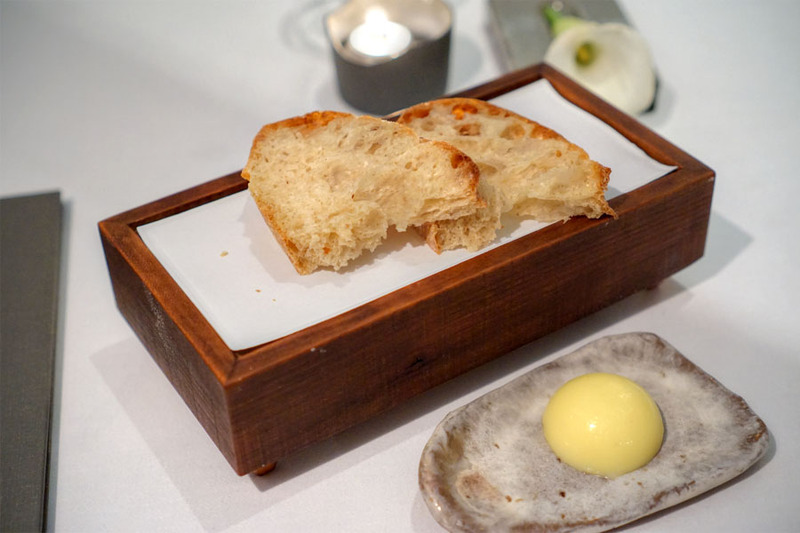 For course #2, bread duties were handled by airy, chewy, subtly tart slices of pane francese, which I eagerly used to sop up the remaining liquid on the plate above. Halibut arrived flawlessly cooked--it was about as perfect as it gets. The fish possessed just the right amount of curry spice, which was smoothed out by the sweetness of corn and coconut while the cilantro offered up a citrusy accent. Along with the halibut came an Austrian Riesling, one brimming with rich fruit and stone on the nose. 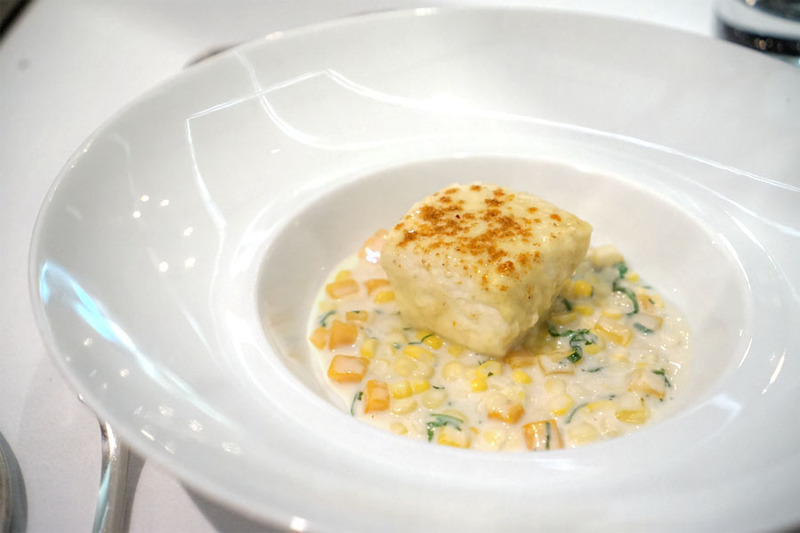 Its taste was super fresh, vibrant, with more fruit and minerals alongside a pleasing tartness and acidity--it did a great job linking up with the sweetness in the dish. I was a bit scared of this next course. First off, I'm very wary of sweet foie gras preparations, and this had peach. Secondly, there's duck confit, and that just sounds like heavy on heavy. Fortunately, the dish actually worked, very well in fact. 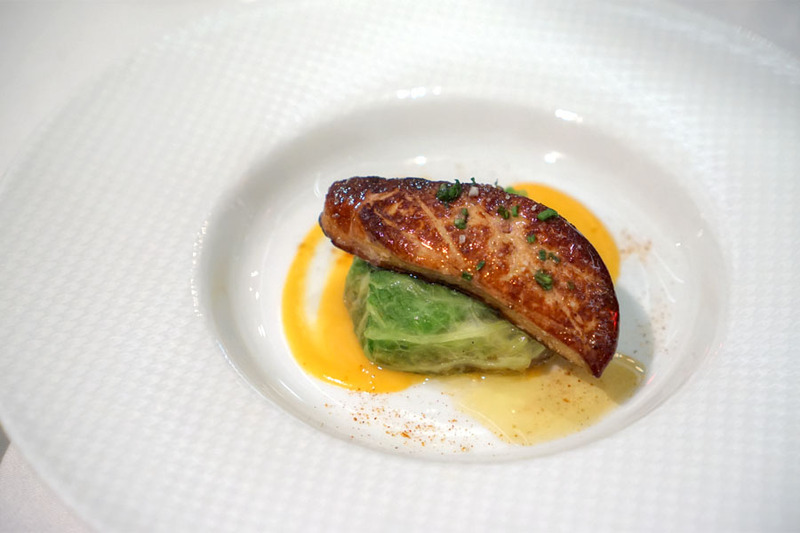 The foie itself was spot on in its sear, and had all the classic flavors you'd expect, while the cabbage worked beautifully for contrast. The surprise here was the confit, which ate as you'd expect, but somehow managed to not be overwhelming; I could say the same about the peach. Obviously, we had to have a wine that could stand up to the heft of the course, and the GSM blend made sense with its generous helping of (tannic) red fruit, pepper, and spice. I rarely see minute steak on menus these days, which I suppose makes sense given that it's typically not the sexiest cut out there. Ziebold's version, however, was a winner no doubt. 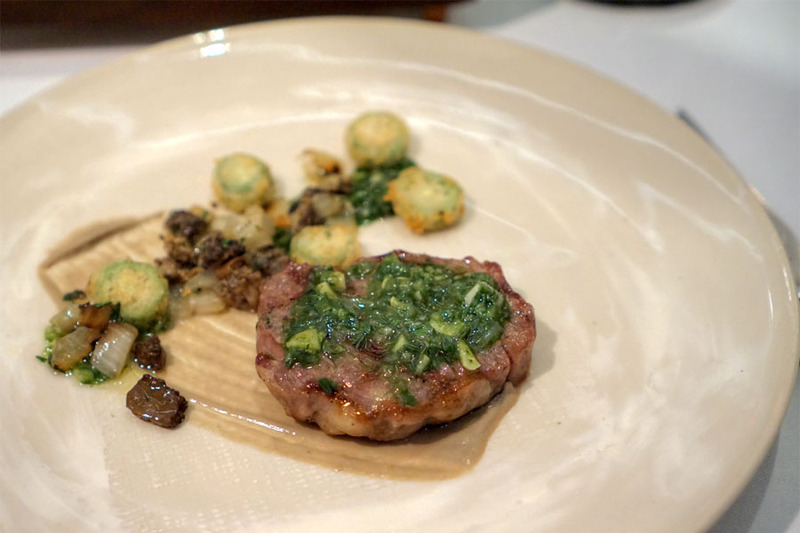 It was tender, sure, but also one of the most flavorful steaks I've had in a while, and I absolutely loved the zippiness and acidity from that herb vinaigrette, while the onions and 'shrooms imparted further complexity to the dish. The meat called for a powerful red wine, and the matched Bordeaux met the mark. Comprised mostly of Cabernet Sauvignon, it was pretty prototypical of the region with its soft, velvety palate of robust berry fruit commingled with some almost meaty notes and a touch of heat. 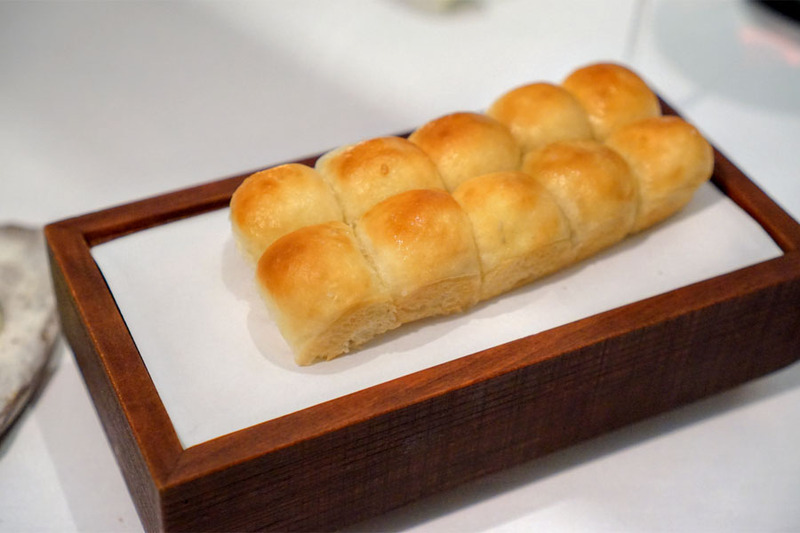 The steak came with a serving of the Chef's famous Parker House rolls, which were oh-so buttery and airy and salty and just as good as I remember from the CityZen days. And yes, I made sure to mop up the remaining liquid above with 'em. With the savories done with, it was time for Pastry Chef Anne Specker (a CityZen alum) to shine. 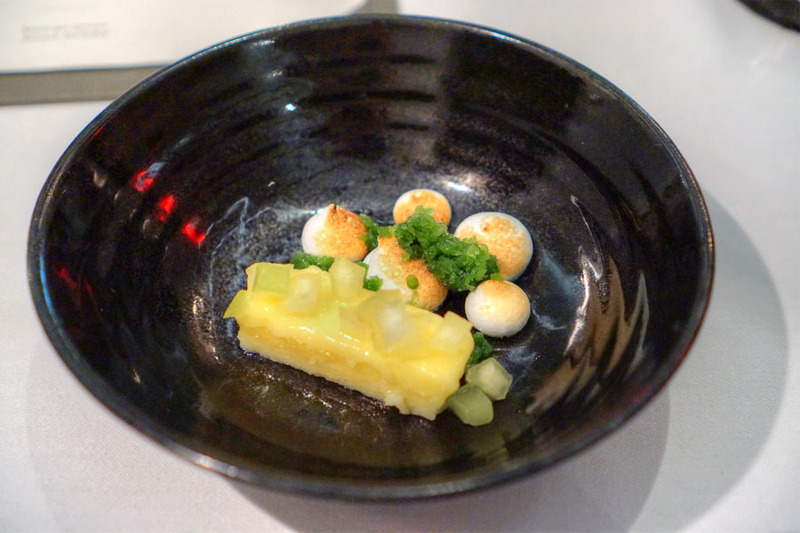 Our first dessert really did recall the essence of a classic key lime, playing the tartness of citrus against the sweetness of meringue while the granita added a bracing, herbaceous component. Going along with the course was a Sauternes with some nice age on it. It was just what I wanted, displaying loads of honeyed, stone fruit-esque sweetness balanced out by a fresh acidity and a touch of nuttiness. 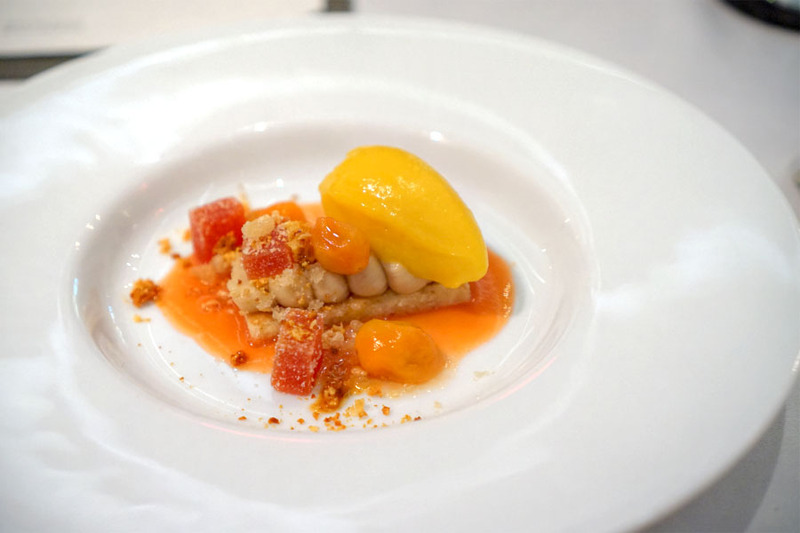 The humble tomato was the hero in our final (proper) course, its slightly savory disposition making itself known for sure against a backdrop of peanut--very neat. 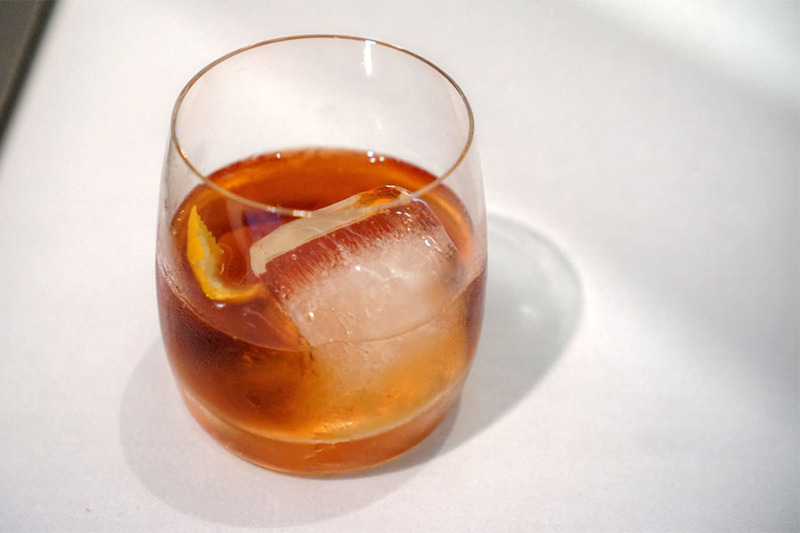 To drink, we moved away from wine and into cognac, specifically an ocean-matured example filled with warmth, sweetness, and spice, along with notes of wood and mature grapes. 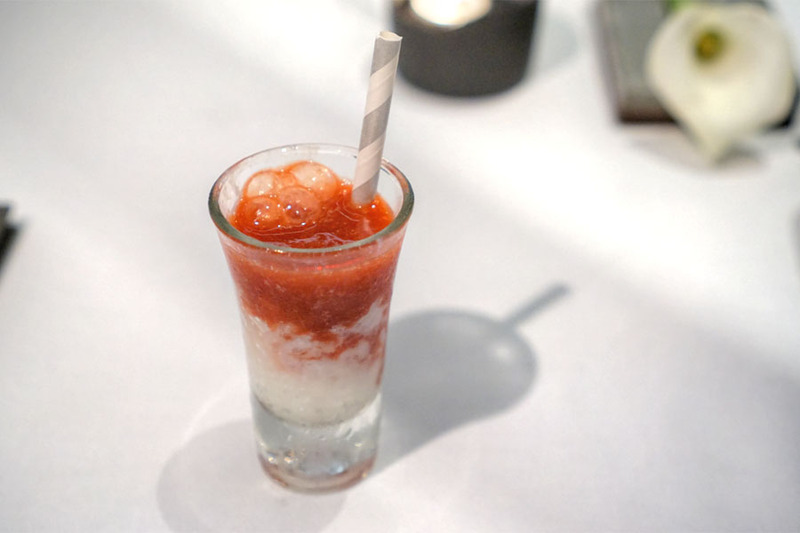 At this point, I was provided a shot glass of milk granita and instructed to construct my own milk shake, choosing from flavors of chocolate, vanilla, and strawberry-verbena. I think it's obvious from the color which option I picked. In hindsight, I should've gone with Neapolitan. 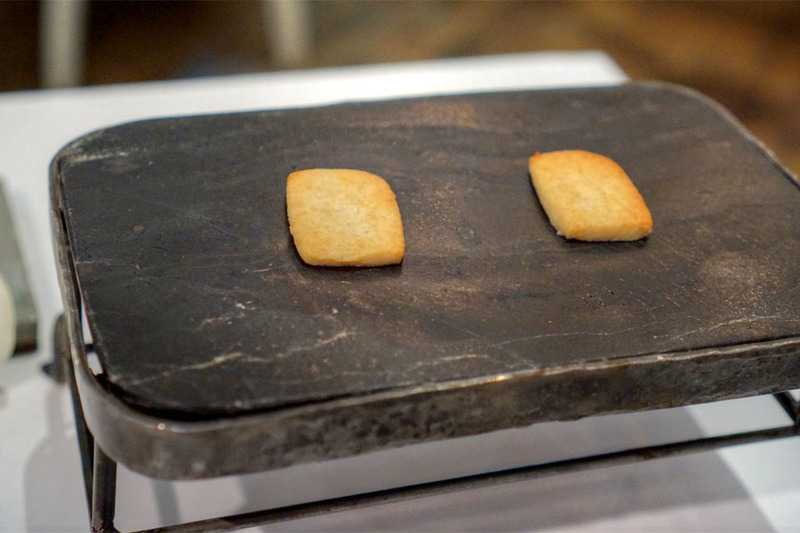 Next came some wonderfully crisp, buttery, freshly baked malted vanilla shortbread cookies. I requested a digestif and was brought this rum-based cocktail. It had a nose of warming spice and caramel mixed with citrus. The taste was sweet and fruity and chocolatey from the rum, with a smidge of bitterness and a long-lasting finish filled with brown sugar. Guests were provided a vial of Old Bay olive oil to take home. And fortunately, I had no issues taking this in my carry-on luggage. Tonight's meal effectively confirmed Ziebold's position as one of the top toques in DC. His food isn't necessarily flashy, but it is pretty much flawless (as was the service). There's a familiarity to the dishes, yet I still find myself pleasantly surprised at every turn. I get a restrained playfulness in the cooking, as well as a sort of quiet confidence that must, I imagine, stem from years and years in the biz. 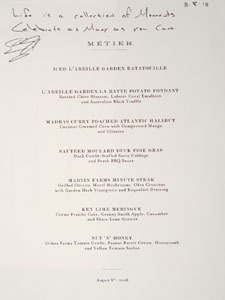 I think it's safe to say that Métier's got to be one of the premier dining experiences in DC. There seems to have been a lot of carbs in this meal of yours....I'm worried about your digestive intake.